This weeks Wrestling rivalry probably wasn’t a classic. The year was 1996 and in all honesty most of the eyes in the wrestling world were not on WWF but rather WCW. This was the year that Hogan turned his back on the fans and joined heel stable the NWO in a story that was very well plotted. Initially anyway. This left the WWF with Shawn Michaels as their champion, his opponent’s were members of the evil Camp Cornette. Names like Owen Hart, Yokozuna, British Bulldog and eventually Vader were all brought in to rival Michaels (and in some instances his on / off tag partner Diesel). From April 1996 (When Michaels won the Title in an Iron Man Match from Bret Hart) through November 1996 the PPVs were headlined primarily with Michaels against a member of Cornettes group. 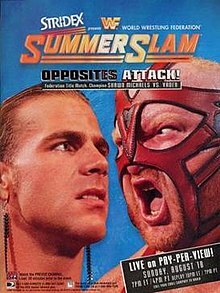 We g0t events like In Your House International Incident, Beware of Dog and the focal point of the feud was Michaels Vs Vader at Summerslam ’96. Looking back at this rivalry now it really was just the heel faction going against the champion one by one. But in turn those names made Michael’s first reign as champion a success. Yes we all missed Bret Hart, a mainstay name through the early 1990s ,and it was a massive boost when he eventually returned having not gone to WCW yet! (Good thing too 1997 was a huge year for the Hitman, and arguably one of his best for match quality too). The rivalry between Cornette’s men and the champion was, in the grand scheme of things, nothing more than filler. WWF’s version of Hogan Vs the Dungeon of Doom perhaps. But to me, at a time when I was new to wrestling, This stuff was great. Towards the end of this era we also have the great No Holds Barred match between Mankind and Michaels. This one is still a classic and a good indication to where the WWF was heading.